A crystal ball is an iconic symbol of fortune telling. TV shows and movies have a long history of depicting gypsies, witches and supernatural beings peering into a crystal ball in order to access the secrets of hidden realms. But you don’t have to be a wizard or sorceress to perform a crystal ball reading. A crystal ball can be a powerful tool for gaining insight into your life. Even better, anyone can learn to use a crystal ball effectively. Here’s how to use a crystal ball to look into your past, present and even your future! If you’ve never shopped for a crystal ball before, you might be surprised at the variety of options available. While almost all crystal balls are made of glass, they can also be made from many different gemstones and crystals including amethyst, smoky quartz and more. You can find crystal balls online or in any New age store. While shopping online is convenient, many people prefer to actually touch the crystal people in person. This allows you to get a sense of the energy emitted. Don’t worry if a retail location isn’t nearby. Many online New Age websites offer high quality crystal balls, also sometimes called fortune teller balls. Just make sure your online retailer offers a return policy if the crystal ball doesn’t emit strong vibrations upon arrival. When selecting a crystal ball, pay attention to size. A bigger crystal ball is easier to use. The larger surface area is easier to concentrate on. If you’re new to using a crystal ball, select a larger size. At the same, a larger size ball can be slightly more difficult to handle and store. Most beginners are well served by a crystal ball which is bigger than a softball but smaller than a bowling ball. 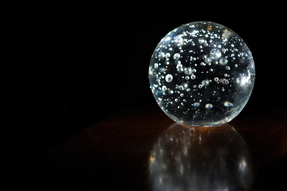 Wash your new crystal ball with soapy water. This helps remove the energies of anyone else who might have touched the crystal ball in the store or shipping facility. After cleaning, don’t let anyone else touch your crystal ball. When not in use, store the ball in a safe, dust-free place. Try not to wash it unless absolutely necessary. Using a crystal ball requires a carefully prepared environment. Any calm, secluded, quiet area of your home will probably work fine. Many people prefer to burn incense or play quiet spiritual music when using their crystal ball. Lighting is very important. Beginners will have an easier time gazing if the room is dimly lit. Keep the blinds closed and all electric lights off. Instead, light the room with just one or two candles. Place the candles behind you. This prevents candlelight from reflecting into the crystal ball, which will impair the functions. First, sit quietly and allow yourself to relax into the moment. The crystal ball should be in front of you at a comfortable height. If you have a question you want to be answered, mentally ask it. But generally just relax and empty your mind. Now you’re ready to gaze into the magic crystal ball. Let your eyes become slightly unfocused. Pay attention to the growing feeling of connection between you and the ball. Hold your gaze. Don’t blink or look away. Simply exist and don’t try to form any specific thoughts. After some time, a mist will form. This is the moment when your subconscious is connecting to the crystal ball. Typically, the mist will only be visible briefly. Once the mist clears, you’ll begin to see pictures. Don’t try to immediately make sense of what you’re seeing. Simply watch as images form. Most likely, you’ll see a series of images all flowing into one another. You’ll probably be very thirsty. Drink some water if you wish. Then immediately write down everything you remember about what you saw. Don’t try to edit yourself. Simply describe every image as best you can. You’ll also want to note every feeling you remember. 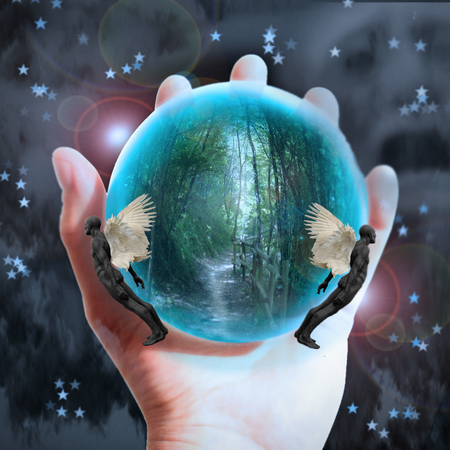 A crystal ball is a powerful tool for looking within your subconscious. This inner world is where we can find the complete truth about our path in life. Although crystal ball gazing can be difficult at first, eventually you’ll be able to open a door into a world of wonder.